rackk and ruin: INKS AND THREAD . :: GIVEAWAY ::. I recently re-connected with fellow UVM grad Maggie Pate via the wonders of Instagram. After spending a few years in NYC post college, Maggie returned the beautiful mountains of Eastern Tennessee where she was raised. She's been busy working on a collection of geometrically and biologically-inspired textiles and scarves called Inks & Thread. Maggie has generously offered to give away one of these beautiful scarves on Rackk and Ruin! I chose the Thunderbird Tracks scarf for the giveaway because I was immediately drawn to the chevron pattern and light chiffon material. To enter the giveaway leave a comment (with your email) below! Random drawing will be held on Monday, August 5! 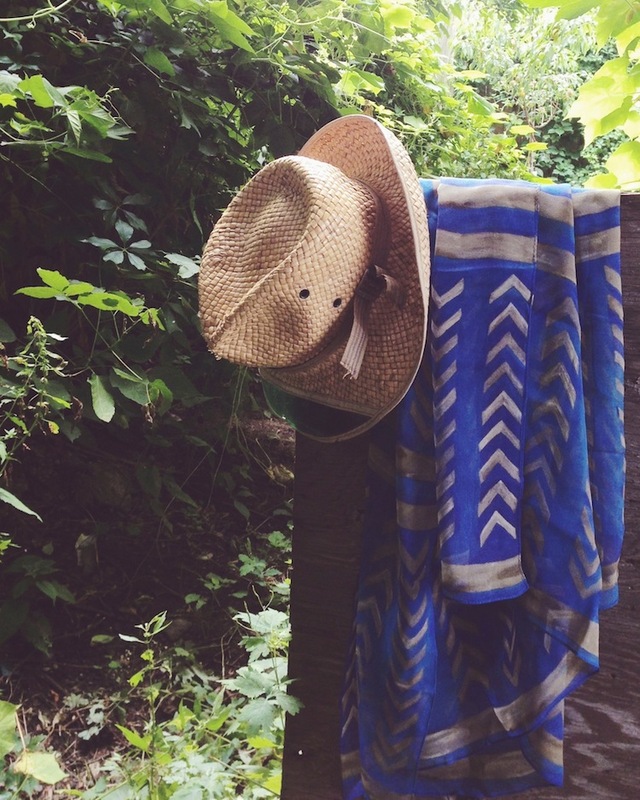 Check out Maggie's Instagram feed if you love gorgeous photos of flora, fauna, food and textiles! How lovely! I'd like to know more about her process. Is it painted? Printed? Batik? Other? I'm obsessed with her designs, and etsy store. She has the most amazing aesthetic. I'd love to win one of her scarves! Love the electric blue color and pattern! What a gorgeous scarf! And it's always nice to see a fellow UVM grad doing something so awesome! Hello! That's a beautiful scarf. I've been on the hunt for some new scarves to use as coverups for nursing my newborn baby and also with fall just around the corner. Nice fabric design. Love the chevrons. Stunning...the blue is really incredible. LOVE IT! Cobalt blue is amazing. Sooo pretty! Love the way you styled it too. Checked out her Etsy shop and there is a tablecloth in the same print. Thank you for sharing this artisan with us! It must be pretty hard not to want to keep this!!!! That scarf is super pretty! Perfect for the current weather here. So pretty! I love the color combo! very pretty scarf - would to see/hear more about them. The print is beautiful. Well done! Hope I win!! Scarf is super beautiful. Love the chevron print. Also as a fellow VT-er I love your blog x 1000, I am a big fashion lover and outdoor lover, and I seriously dig the vibes of your blog! Keep the stellar posts coming! Beautiful work, thanks for making the connection!